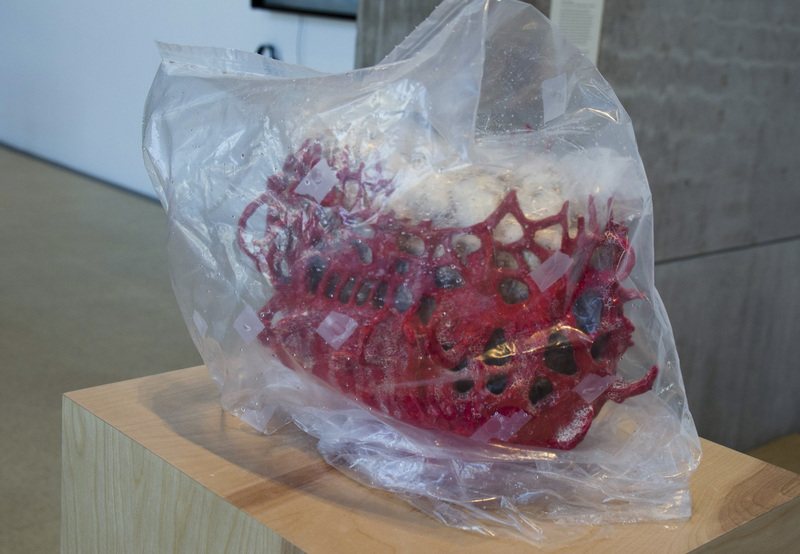 The exhibition “Audible Bacillus,” on display at Zilkha gallery through March 3, is a wildly varied and complex collection of pieces loosely inspired by, of all things, bacteria. Although this claim might seem bold, the featured works largely manage to do justice to this goal, exploring conceptions of interdependency, gaps in communication, and relationships between humans and the environment. The pieces are exhibited amongst samples of stromatolites, the fossilized remains of ancient cyanobacteria. In the famous performance artist Vito Acconci’s piece “Association Area,” Acconci and a co-performer go through “quasi-ESP” exercises in which the two try to imitate each other’s movements through a room while blindfolded and wearing earplugs. As the two men walk slowly, serenely through the space, a voiceover ominously warns, “Turns around. 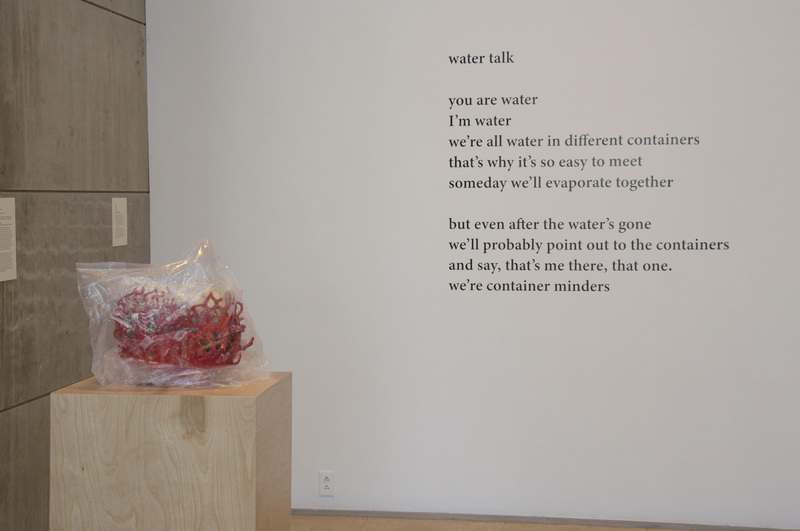 You’re facing opposite directions.” This piece, which explores the question of how we connect to others when our mechanisms of connections are ruptured, sets the tone for the rest of the exhibit with a surreal portrayal of a world in which we seem to have abandoned any religious or environmental scripts. 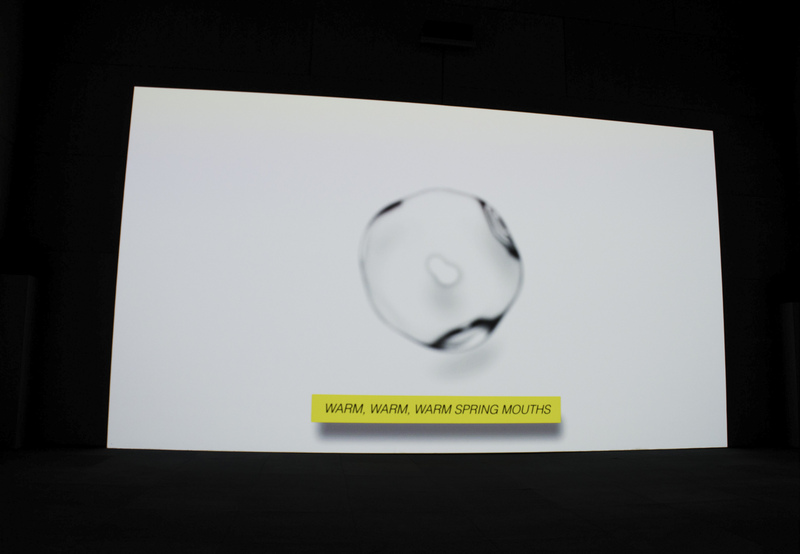 One of the focal points of the exhibit, and one of the more eccentric pieces featured, is Ed Atkins’ “Warm, Warm, Warm, Spring Mouths” (2013), a video that quotes, among other things, Gilbert Sorrentino’s poem, “The Morning Roundup.” The video is long and looping, with phrases floating in and out of the narrative, accompanied by strange animations, including a body modeled after Atkins’ own, and subtitles that sometimes match with the audio and sometimes don’t, allowing the viewer to grasp onto brief moments of clarity or to linger in the spaces between viscerally gripping images. “Once upon a time/a couple of people were alive/who were friends of mine,” recites a strange, animated face. The subject seems to exist in a non-temporal state, a body that cannot or does not want to face its own subjectivity. 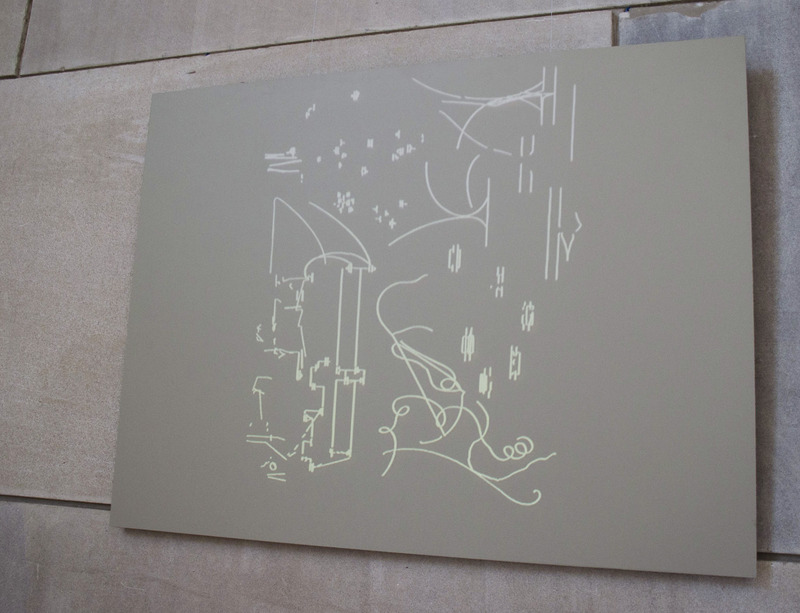 “Abjection as a figuration of a process encountered within oneself is something that might be worth rehearsing, or replaying…a way of encountering ourselves in opposition,” Atkins writes. Here, the body is altered, blurred, as if seen through a rainy window, then confronted head on, naked, grippingly bodily. 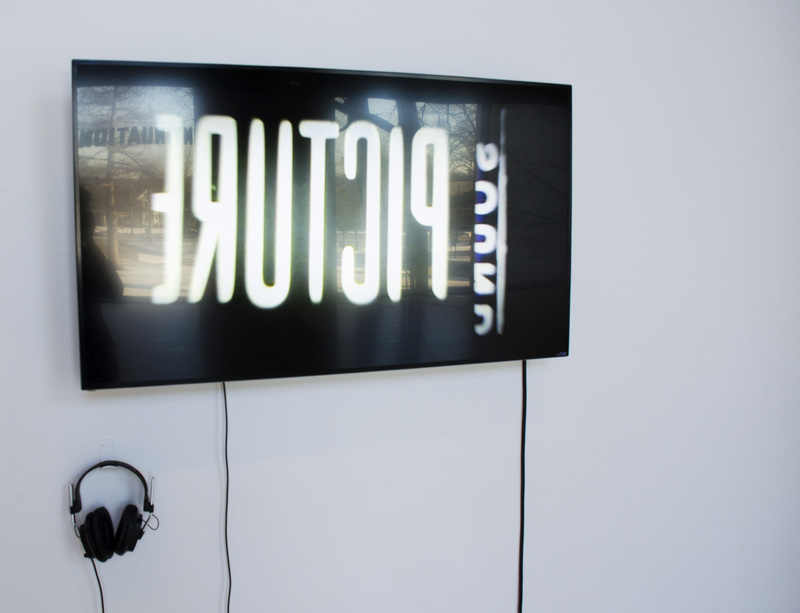 The piece also flirts with ideas of authorship and readership. At one point, a subtitle reads, “Something about external legibility, etc.” The text, which appears in a comic-like black box, is instantly obscured by a complex barrage of imagery. 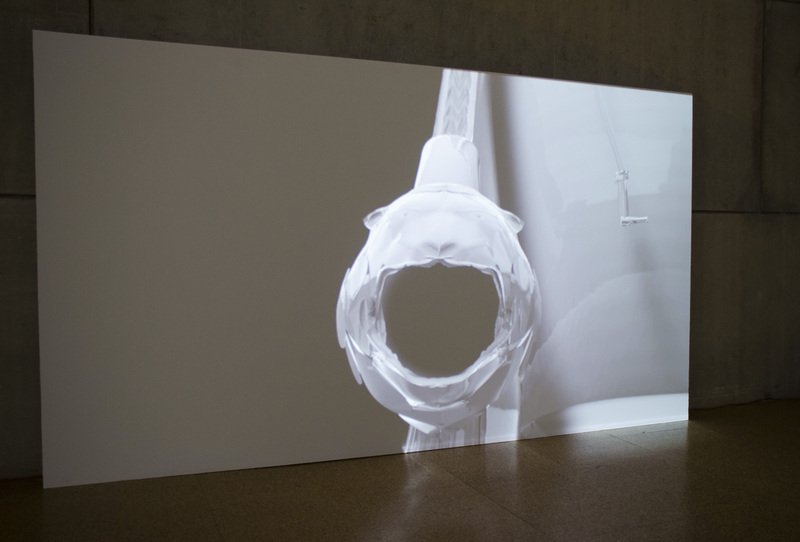 Throughout, Atkins explores ideas of communication and connectivity in a digital age, and of a fractured subjectivity that the viewer is both included in and positioned at a distance from. 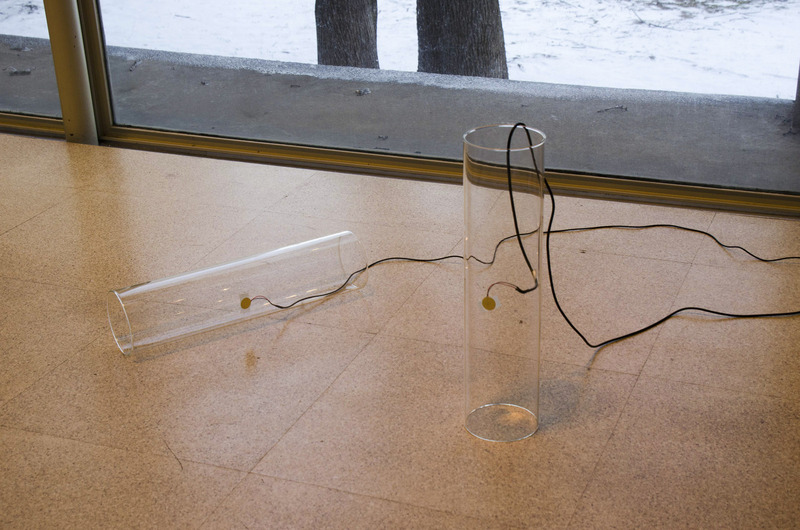 Several of the exhibition pieces also explore music and sound in ways that are deeply innovative. 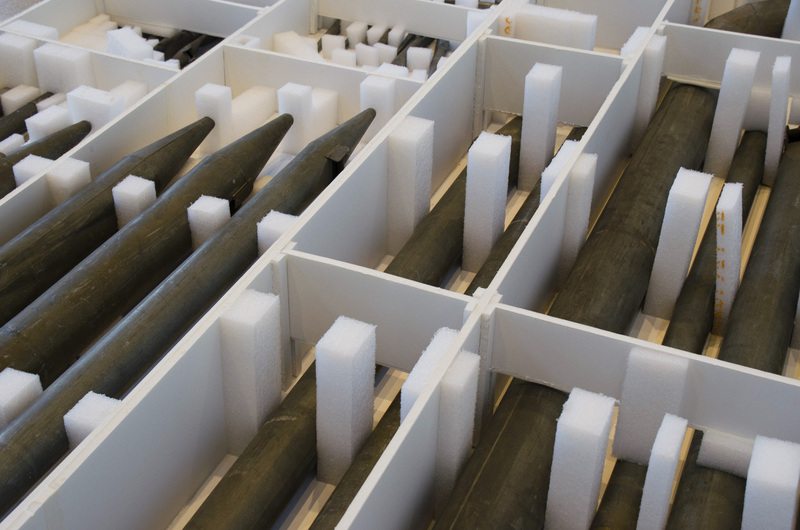 In Lutz Bacher’s “Organ Pipes” (2014), a disassembled organ, with the pipes laid between pieces of foam on the floor, explores what could be termed the potential energy of music. 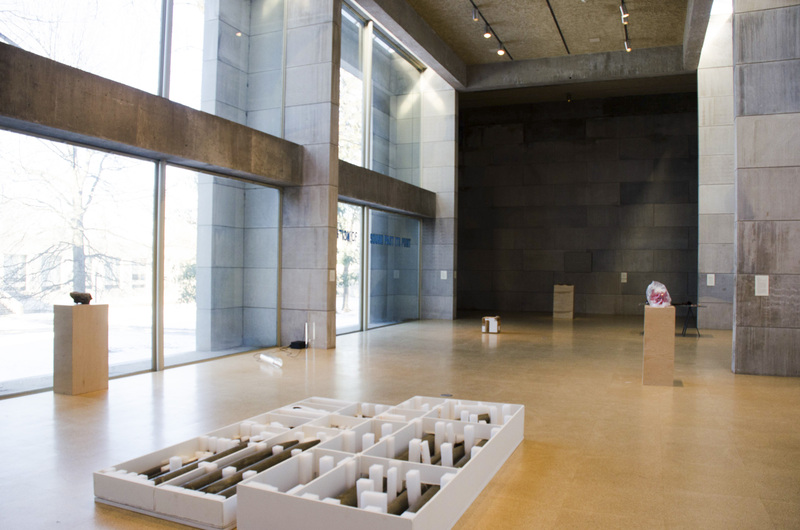 Separated and devoid of actual sound, the pipes are transformed into an architecture of sorts, a Louise Nevelson-like accumulation of shapes that gain a formal complexity that they would lack in their original form. Lawrence Weiner’s piece in the exhibit, large block letters reading “THE CONTINUATION OF A SOUND PAST ITS POINT,” posted on the windows of the exhibition space, explores the relationship between language, materials, and sound. 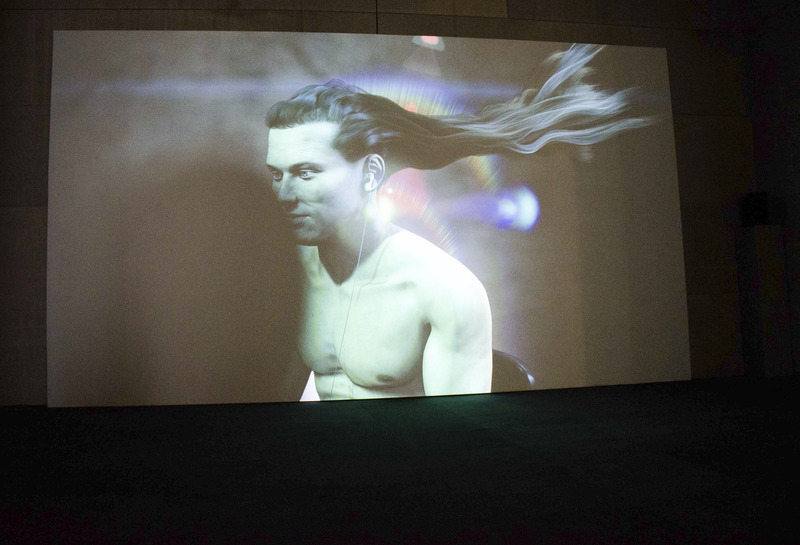 In an even more experimental piece, the duo lucky dragons, consisting of LA-based artists Sarah Rara and Luke Fischbeck, contributed a piece to the exhibition, entitled “Other Transformations” (2019), that is continuing to evolve. The concept compiles an archive of graphic representations of music to explore ideas of translation and to ask, “What is fundamentally necessary for an image to be read as music?” Aspects of musical notation from a broad range of sources overlap and oscillate onscreen, in various clusters and layers that call to mind rhythms and dynamics but do not present as an obviously legible score. Over the next month, a range of collaborators from Wesleyan, both staff and students from a variety of disciplines, will use a software model to generate images that stem from visual patterns of musical representation and will eventually perform a piece generated from an interpretation of the patterns that will take place in Zilkha Gallery on Sunday, March 3. Another exceptional piece was Cauleen Smith’s piece, “The Fullness of Time” (2008), which explored post-Katrina New Orleans from the perspective of a character who was sent from another world to learn about life on Earth. The piece is aesthetically brilliant, with footage of the landscape put into technicolor relief and rendered abstract to the point that we are forced into distance from the accumulations of trauma that we are being forced to confront. The cinematography is shaky, panning, saturated with color. It is a brilliant confrontation with the emotional distance that we experience from the trauma that occurs beneath our eyes, the Othering of people through the violence of tactless media coverage and adapted numbness towards the pain of others. We watch as, in footage-like reels, the people of New Orleans interact with a man who claims to be from the “lower 9th quadrant of the Fireworks Galaxy”—a reference to the Lower 9th Ward of New Orleans that was so devastated by Katrina in 2005. The composer Butch Morris adds subtle textures and otherworldly sequences into a narrative that is complex, poignant and strange. The artist Candice Lin has two of the most unexpected but aesthetically wonderful pieces in the show. Her piece “Memory (Study #2)” includes a species of mushrooms displayed in the “distilled communal piss” of those involved in working on the Zilkha exhibition, in a “twist on the historic practices of institutional critique” that “entangl[es] the community in the production of the artist’s work.” As apparently cringe-worthy as this technique is, it does present a wholly original and smart indictment of the museum institution. Urine, which once distilled loses its toxicity, becomes a substance that is rife for exploring systems of institutional filtration, systems that can implicitly drown out the voices of artists or of marginalized folks while appearing—as a liquid—to hydrate or support growth. The part of the exhibit that fails to contribute much is the stromatolites themselves, which do not present much of an aesthetic texture, and seem to be there mostly for the purpose of situating the other pieces in nature, in a way that seems somewhat heavy-handed. However, despite this aspect falling short, the pieces present an eclectic but coherent examination of contemporary selfhood and the way in which, as humans and as organisms, we strive to understand ourselves. Dani Smotrich-Barr can be reached at dsmotrichbar@wesleyan.edu.